Hi everyone! I have something a little different for you today. Aveniro is a manufacturer and wholesale and retail export oriented supplier of glass nail files located in the North of Czech Republic. I was sent 3 nail files, 1 cuticle stick, and 1 foot file. Check em out! When I first opened the package, I noticed the huge foot file. My first thought was "ok, this can't be a nail file" Duh Manna. It's for your feet! And it works WONDERFULLY to sand the calluses off your feet and smooth your heels. Unfortunately, my husband has decided this is now his, so I won't get to enjoy it anymore lol. I actually had to research what this was. I figured it was a cuticle stick but I didn't know that the other end was for cleaning under your nails. I have used this to push my cuticles back, but not to clean under my nails. The sharp point scares me, and I'm clumsy so I won't be using that end. I was sent 3 nail files. One regular, one bedazzled, and one small one for your purse. Glass files are gentle on your nails and don't leave that gross "nail file dust" on the tips of your nails. Be sure to file in one motion and don't saw back and forth, it's bad for your nails! I actually prefer to file my nails while I still have polish on, it makes it easier for me to file them in the correct shape. You can wash these with soap and water after you've filed a few times and they look good as new again. Unfortunately, you can't just purchase one of these. You have to purchase an order of 100+, so if you find a retailer that has them, I recommend them! 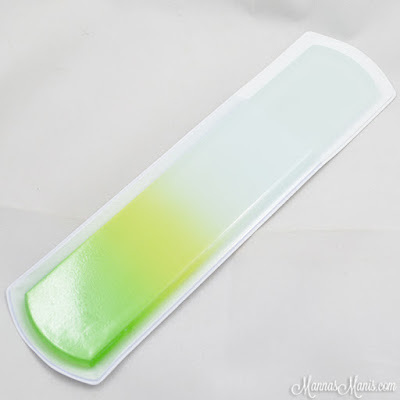 Do you prefer glass nail files?